Everything we do helps your company build its reputation and differentiate in a competitive market. Ivy Cohen Corporate Communications – ICCC – advises its clients on brand building, public relations and strategic communications (both external and internal). Everything we do – from thought leadership to public education, issues management and content initiatives – is designed to help your company build its reputation and differentiate in a competitive market. ​ICCC delivers big agency results with the top leadership attention only a boutique agency can provide. Tap into our issues and change management expertise – and crisis communications when needed. Build strategies for educating, connecting with and engaging your target audiences. ​and not just what you want to hear. We work directly with your executives to help them put their best foot forward, to ensure that each public interview presents their best content, style and appearance. Don’t send your executive for an interview or presentation blind. They may have great instincts, but need to hone in on a strategy for the audience, focus on the topic, and avoid tripping up. Our active facilitation of interviews can prevent mishaps and ensure that key information gets out. Our philosophy is that there is always a new or better way to get results. Brainstorming for us is not about listing what everyone did last year. Even the most creative approaches must promote your business objectives and be executable. We’re always looking for the next big idea even when you don’t explicitly ask for it. We take on a limited number of clients at any one time, so that Ivy Cohen can work hands-on with every account. There are no hand-offs to recent college graduates. Our team operates throughout the U.S. on programs fielded nationwide and around the globe. We have the capacity you need to collaborate on strategy and implement expansive programs. A team will be assigned for your needs based on industry expertise or customer audience. There’s no need to supplement pricey office space or staff not currently active on your business. Ivy lectures on change management communications at The New School, Milano School of Management. 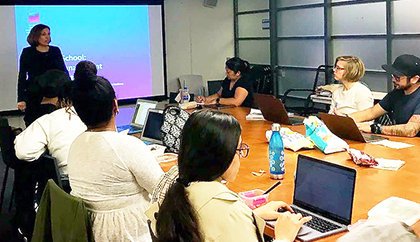 Dean Latha Poonamalee and her graduate students engaged with Ivy in a riveting conversation about handling experiences they are experiencing their organizations, as well as preparing for increasing the value of the work that communications professionals contribute to changes large and small.